Two piece jewelry boxes are the best choice for presenting your products for purchase. These boxes are a great complementary offering to give to your customers after the sale for easy packaging and presentation. 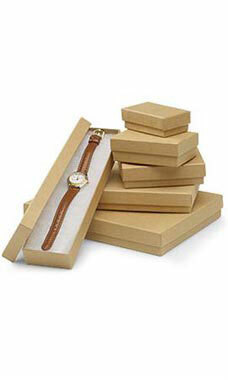 Our Kraft cotton-filled jewelry boxes are made of 100% recycled material. Each box includes a removable poly/cotton fill. Each assortment includes: 15 each of 87401, 15 each of 87402, 25 each of 87403 10 each of 87404, 5 each of 87405 and 5 each of 87406.